Selva is still an experimental game in the process of more extensive play testing. SDG has implemented a number of rules clarifications and modifications. All of these changes have been approved by the author. Further suggestions or questions are warmly welcomed. Stones bump others with a force equal to the number of intervening blank spaces, not one less as currently stated in the official rules. The standard way I call Entropic, meaning the only force actually generated is with the initial strike. That force gradually dissipates with each subsequent bump. 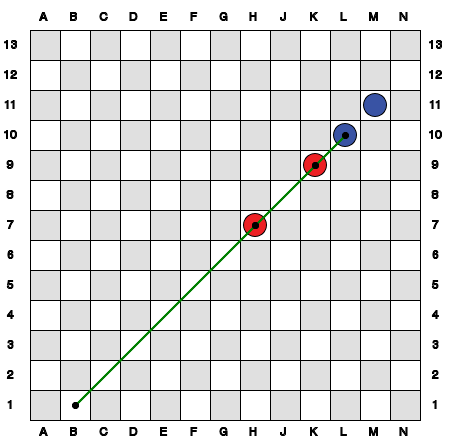 A variant allows for Segmented energy propagation where each stone exerts the same force as if it had initiated the strike (viz. a force equal to the number of intervening blank spaces). Elephants and Hummingbirds add/subtract a force of two(2) to their strikes. Springy and Absorbent walls add/subtract a force of two(2) when struck by a ball. It is possible for an Absorbent wall to reduce a ball's force to < 1 in which case the ball stops dead. If a Tiger moves to a space adjacent to one or more opposing stones, it eats all of them. When a Tiger is bumped, it does not attempt to eat until it comes to a complete stop. At that point, any adjacent opposing stones are consumed. If a Tiger is bumped in to an opposing stone, the Tiger stops moving (replacing the bumped stone) and the stone is consumed (as well as any adjacent stones). If a Tiger is "trapped" (totally unable to move due to the official line-of-sight rules) then that player is considered in check. That player must immediately free his Tiger or lose the game. This is the standard (entropic) result if the stone at B1 struck the one at H7. B1 strikes H7 with a force of 5. The struck stone then moves one space before striking another. The resulting force is 4. The 2nd bumped stone also moves one space before encountering another. The resulting force is now 3. The final stone now moves 3 spaces, ricocheting off the wall. This is the segmented result. 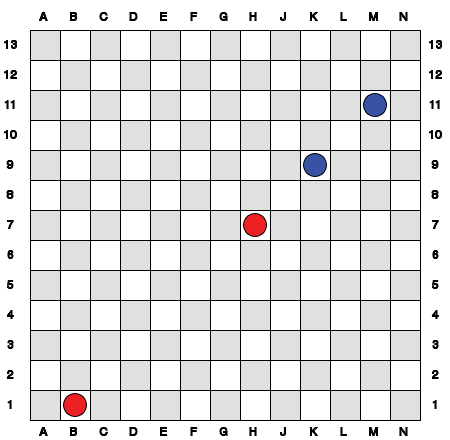 B1 strikes H7 with a force of 5; however, the bumped stone only travels one(1) space before striking another. The resulting force of that strike is therefore 1. 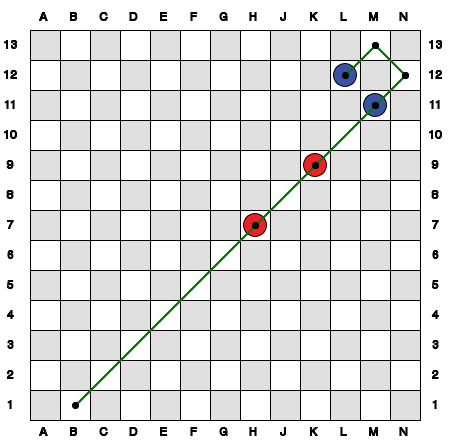 The 2nd bumped stone only moves one space and then stops before striking the third.